Flights to Cape Town International Airport booked via SouthAfrica.TO qualify to earn our exclusive travel vouchers. Simply email a writeup of your flight to cheapflights@southafrica.to and we'll send you vouchers. Cape Town International Airport is an award-winning airport situated about 20km from Cape Town's city centre. Don't fret though, it's a quick drive as the N2 connects the city centre, airport and Somerset West. The airport has been recognised as the best in Africa (SKYTRAX) and welcomes both domestic and international flight. The small airport will soon undergo some major changes, all while still serving and connecting the Mother City to the world! Cape Town International Airport, operated by ACSA, has once again taken home the top honours at the SKYTRAX Awards. The airport beat out competition from Durban (2nd) and OR Tambo International (3rd) to be named the best for a seventh year in a row. The airport was also placed 21st in the category for Best Airport in the World. We've never been more proud of our favourite domestic airport! 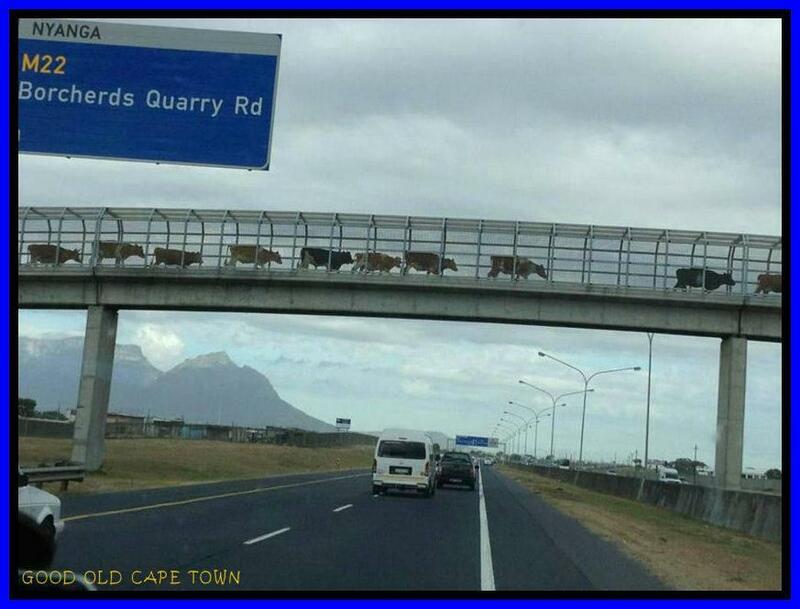 Keep an eye out for the cows as you leave the airport! More details are being released about Cape Town International's makeover which will see, among other changes, a new international terminal and the runway realignment. The R7 billion overhaul will likely take 4 years and is set to begin in 2020. The most talked about subject is the realigned runway which will allow for a longer runway so that larger passenger airplanes, like the Airbus A380, can be accommodated. It is not only international travellers that will benefit. R688-million will be used to expand the domestic arrivals terminal, where both the baggage hall and welcome area will be reconfigured. While we're still a year off from construction beginning, ACSA has advised that operations will continue as usual at the airport. They have also advised that while some changes and discomfort might be unavoidable, they will put precautions in place to minimise any passenger frustration. It wouldn't be fair for OR Tambo alone to receive an upgrade, South Africa's best airport is also getting an expensive makeover. The much-talked-about runway realignment is finally on the cards as is a redevelopment of Terminal 2 and a new domestic arrival terminal. The nearly R3,2 billion makeover will start in March 2018 in phases and all is expected to be completed in 2023. As Capetonians were preparing for Day Zero - which has thankfully been postponed indefinitely- the airport has taken some measures to reduce its water consumption. You will now find waterless handsanitiser in place of handwash in most bathrooms and also find that many taps have been turned off. While we no longer face the imminent danger of running out of water, H2O is still a scarce resource that we've learned to treasure! So please join us in saving water during your visit. ACSA has provided a WIFI (Wireless Internet Access) facility at the International as well as at the Domestic Terminals. Passengers can enjoy 30 minutes worth of free Wi-Fi when connecting to the SSID Always On Wi-Fi and then completing the registration form. There are Bidvest Premier Lounges both at domestic and international departures at Cape Town International Airport. These offer shower facilities, towels, shampoo & body soap, a view of the apron, baby changing facilities, a smoking room, snacks, beverages, magazines, newspapers, TV & WiFi. You get a 10% discount if you book online, as opposed to walking in. Their email is BidvestLounge@bidair.co.za and you can phone them at 011 390 8660. Cape Town International has approximately 2600 parking bays with shade-net covering in the general car park, which runs along the length of the airport opposite the terminal buildings. The Multi-Storey Parkade (MSP) is a five-storey facility offering an additional 2 000 parking bays to Cape Town International’s parking infrastructure. This facility offers airport users more choice in terms of parking and is equipped with CCTV cameras, special trolley hoists for effective trolley management and a variable message system that displays the number of available parking bays. There is also a roaming shuttle service available that picks up passengers and drops them off throughout the car park and as close to the terminals as possible. Parkers should also note that there is a pay- on- foot system in place, with pay stations situated outside the terminal buildings only, thus no payments can be made at the exit. The pay stations accept coins (R1, R2 and R5) and notes (R10, R20, R50 and R100). All major credit cards are also accepted. If you're simply picking up or dropping off a traveller, you can do so without incurring any cost! There is a drop-off parking area in front of the entrance to the top floor. Passengers can be collected from the 1st parking lot, but you need to collect a ticket and only have a limited time before incurring costs. Call (021) 935 5708 for general enquiries. For a full list of options, see Cape Town Shuttle. The airport itself is considered generally safe with no higher crime rate reporter than at any other airport in the country. Passengers should take care though, be alert and never leave their luggage or personal belongings unattended. The airport has been a target for protesters in the past, but this is a rare occurance. Passengers travelling to the airport on the N2 should be alert, especially if travelling alone or late at night. The road has been a smash-and-grab hot-spot. The airport has a police station based on its grounds and any crime can be reported there. 15 January 2015 : Bidvest recently opened a brand new International Premier Lounge at CPT International Airport. The new lounge which is situated just outside of passport control at the international departures terminal is larger than Bidvest’s previous lounge. The lounge will be catering for around 50 000 people annually which is why they have had to increase the space of the lounge. The lounge will be open every day of the week from 05h00-23h00. 24 October 2014 : Cape Town International Airport have started producing their own wine. Yes you read that right! Their first Merlot produced with the help of Du Preez wine and is expected to be ready for bottling at the end of 2015. What a great way to kick-start your trip to the Cape Winelands! 2 September 2014 : Airports Company South Africa (ACSA) is planning to spend around R3bn to develop a new runway at Cape Town International Airport. ACSA plans to have the new runway up and running by the end of 2018 with construction to start in 2016. ACSA has spent millions of rands over the past few years on upgrading the runways at South Africa’s 9 national airports. The new airstrip will allow Cape Town International to handle more traffic and with the likes of Emirates looking at flying into Cape Town with an A380, runway upgrades could not come at a better time. 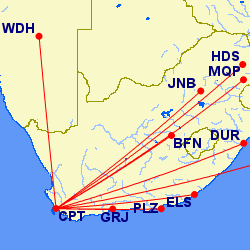 20 Feb 2014 : Cape Town International Airport is the Best in Africa! It's just won the ASQ award for Best Airport in Africa. 10 December 2013: At the moment the 2 runways at Cape Town Airport intersect. Cape Town Airport's general manager, Deon Cloete, says that it is becoming necessary to realign the 2 runways at the airport, to enable more traffic to land. The estimated cost of R3bn, which would need ultimately need to be paid by passengers. The left-luggage facility, in the Domestic Arrivals terminal, charges R15 per bag a day, irrespective of the size of the item. Moda Exotica, in International Departures, charges R20 per item per day, regardless of the size of the bag. Ladies' restrooms in all terminals have places to change babies. If you don't have luggage there are various self-service check-ins around Cape Town airport. The banks ABSA, FNB and Nedbank have automatic teller machines (ATMs) in Domestic Arrivals. Standard Bank, ABSA and Nedbank have ATMs in Domestic Departures. ABSA also has a bureau de change here. ABSA has a bank, a bureau de change and an ATM in International Departures. You will find a Master Currency bureau de change in International Arrivals. While smaller than it's Joburg counterpart (OR Tambo International), Cape Town International does boast all the shops necessary. This includes multiple take-out restaurants and coffee shops along with a CNA, Woolworths, pharmacy and many more. The Premier Lounge, a stone's throw from Domestic Arrivals, offers venues and catering to suit all tastes, as well as satellite office space - with full infrastructure and secretarial service - for short and long rental. ACSA in partnership with OCSA have a clinic available in the Southern Office Block at the airport. There are restrooms or toilets in all terminal buildings. Baby-changing facilities and other amenities for young children are to be found in all ladies' restrooms. Shuttle buses run from International Arrivals and Domestic Arrivals. A trip in a shuttle bus costs about R120 a person; any extra passenger from the same group pays only R30 more. Arriving passengers should use only Touch Down Taxis, the officially authorised airport taxi company. When you're visiting Cape Town and need to stay near the airport, then try Hotel Verde. Their gym even has a system which feeds into the grid & generates power! (as you gym equipment shows you how much energy you're putting in). Foreign visitors leaving South Africa may claim back Value Added Tax on purchases from the VAT refund administrator. The goods have to be shown to the administrator before check-in. The VAT refund office is on the ground level of International Departures. Only after a passenger has checked in and passed through passport control is the value of the VAT (less the administrator's commission) paid back. This happens on the ground level of International Departures, between passport control and the boarding gates. At the international departures hall this is the last spot to say goodbye - from this point onwards it's "passengers only". Before you leave South Africa, be sure to get a customs interview to document items of a high value which you are leaving the country with (e.g. laptops, cameras, but not cellphones). Once you've checked in for an international departure at Cape Town International Airport, this is the hall you wait in for your flight. Note the wi-fi hotspot on the right. Whilst the new terminal building was being constructed, a temporary marquee tent was being used as domestic departure gates. Seated on the starboard side as one lands in a southerly direction. Seated on the port side as one lands in a southerly direction.